On the eastern side of Mt Pleasant just south of the summit ridge, and just west of the old World War II concrete gun emplacements. The crag faces west, and runs south from the zig-zags in the track. There's good shelter from the north-east, and it's nice and sunny on a winter afternoon. It can be hot in summer. It's exposed to the south, but there's a degree of shelter in a north-wester, though others would be preferred. 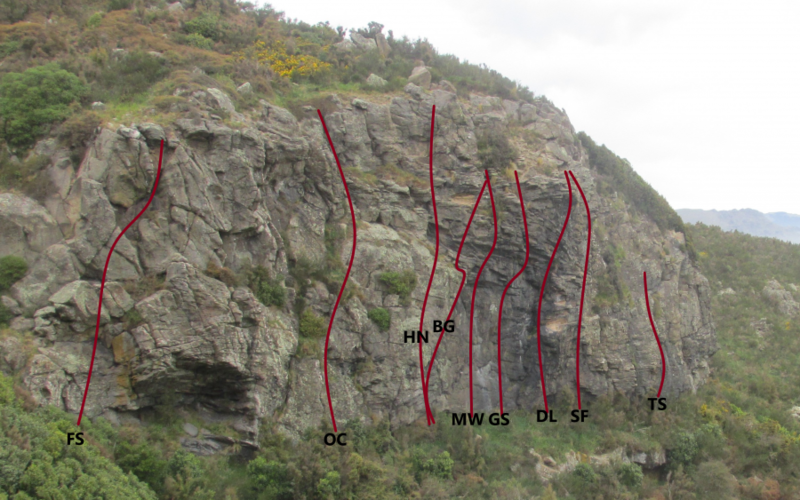 Climb grades range from 14 to 24, concentrated in grades 19-21, and many are excellent climbs. Most routes are well protected, many with bolts, but three of the oldest routes, on the right end of the cliff, are awaiting re-bolting and the bolts may not be safe. The rock is the coarse-grained Mt Pleasant trachyte, which gives excellent friction. As with all the Mt Pleasant cliffs, beware of loose flakes, especially as many climbs have had only a few ascents. 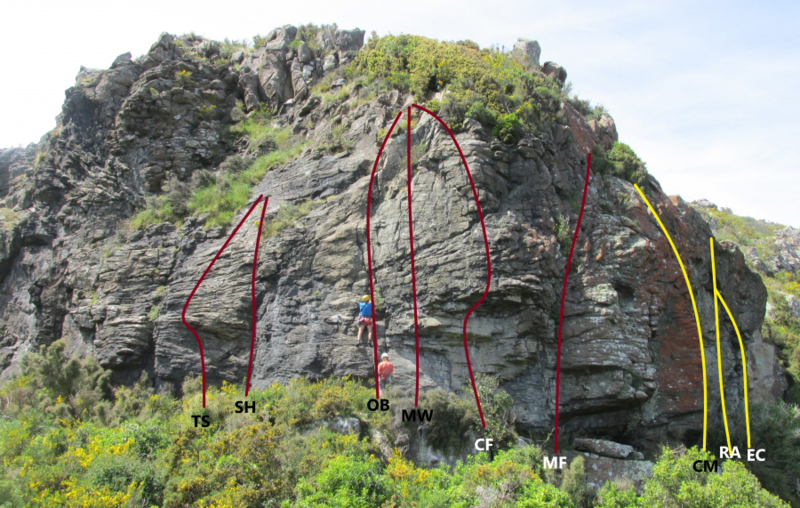 The initial climbing by Brian Fish and Joe Arts in 1981 of five routes on the south-facing right hand end was an odd quirk in the development of Christchurch climbing. At Lyttelton Rock, Scratching Julius, which was the catalyst for development of that crag, had not yet been done. To reach Crag X more accessible crags were bypassed, and the largest part of the crag was ignored. Little wonder that the crag was mostly left alone for a decade, until Joe Arts started a second phase of development in 1991-92, of which the notable route was the crag's showpiece, Gripping Scales. Finally, in October 1997 Lindsay Main and Joe Arts set some kind of a record by doing eight new routes during one hot spring day to clean up most of the obvious remaining lines. The fastest approach is to park on the Summit Road at the pine trees and walk south across Greenwood Park, southward along the vehicle track to the gun emplacements. Cross the fence at an old sign and pick up the track that zig-zags downward the gully toward Lyttlelton. 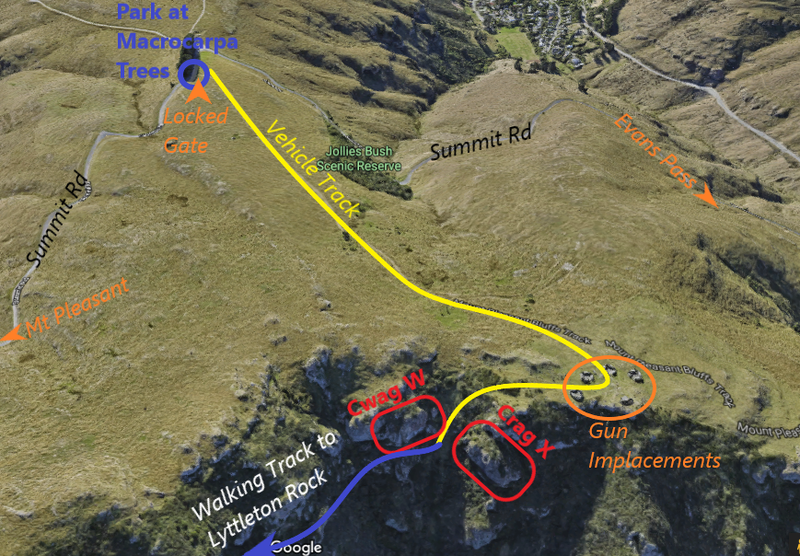 You can also park at the Major Hornbrook Track, as for Lyttelton Rock, and walk along the Bluffs Track. However this is quite long. Climb the slab just right of hairline crack. Move left and up through bushes to sharp low angled arete. Climb up the left side of this to an overhang down and left of skyline V notch. Move up and left to good position on prominent prow, and up. Good climbing once past the trees. Two ropes and slings handy. The finish is good. A powerful route up the left side of the black wall, vaguely following a white streak. Three bolts with chain links. Technical moves to reach the second bolt, then left a little and haul up (beware loose holds) to a ledge with natural pro; then up to the third bolt and the anchor chain on good holds. A magnificent route up the right side of the black wall and through the overhangs above. Tricky moves with natural pro to the first of three bolts, then past the second bolt on the right and into the overhang on huge jugs past the third bolt to ledges. Anchor at a boulder at the top. Up the obvious corner right of Gripping Scales, avoiding the lawyer by traversing right on to the ledge halfway up. Beware loose blocks. Place a wire, then clip the bolt and climb the steep wall as for the finish of Black Magic (crux) past another bolt on big holds. The obvious black arête at the right edge of the main wall. Up on crumbly foot-holds to the first bolt, with a reach to good holds at the second bolt just above. Pull through and place a small cam below easy moves before the headwall steepens above. Move slightly right of the third bolt and climb straight past the fourth bolt through the lip on great holds. An overhanging weakness about three metres right. Natural pro to reach the first of two bolts to the ledge. Then finish straight up to the right of Black Magic with a wire and a third bolt for pro. Start at a bush and climb the left-leaning, overhanging crack (crux) to a ledge. Up to another ledge and finish up Something Fishy with two bolts and a wire. Steep V-chimney/niche. Up on some big holds and move left past the grass; then right to skirt the prow and climb the headwall. Pleasant climbing up a vague crack with reasonable pro from wires. Pleasant climbing up a vague crack with minimal pro from wires. A steep wall route through a small roof (crux). Start at TRR and clip the new bolt. Climb the corner crack with shrubs. When the corner ends head up and R (unprotected) to a shrubby ledge. Move left to a rib or flake at left end of slab, up this. Along the shelf and around the bend is this obvious corner which no longer contains a fuchsia bush. Good bridging with some tricky and committing moves. Prominent arete with red lichen, climbed on the right. Grunty bouldering start to reach the first bolt - somewhat serious with the three metre drop below the starting ledge. Then on up the wall to the right of the arete past a second bolt. A strong line right through the overhangs in the centre of the red wall. There are paired bolts, then natural pro and another bolt. A direct line through the overhang and up the steep wall above. Four bolts. Start on the right of the wall up a broken corner, and then up past a bolt on the steep wall above. A solo route on the arete to the right of Existential Climber, possibly protectable. Obscure short solo route right of Champagne Breakfast. On the red pillar below the main cliff, accessed by crashing down through the broom scrub. The route is believed to be up a thin crack on the arete, minimally protected with small wires behind a possibly secure block. The grade is a guess. Grades & Bolt counts aren't being copied from the Pitch info for some reason?